Donizetti’s rarely performed opera Poliuto was written in 1838 for the Teatro San Carlo in Naples. The libretto by Salvadore Cammarano was based on Corneille’s play Polyeucte which describes the events leading up to the martyrdom of Saint Polyeuctus. The opera has a fascinating and curiously chequered history. Prior to the start of rehearsals for the opera, King Ferdinand II forbade the production as he did not think it appropriate to show the martyrdom of a Christian saint on stage. Donizetti decided to move the production to Paris and revised the opera, using a French libretto, under the title Les Martyrs . The original three-act version of the opera lay dormant and was not performed until 1848 some months after the death of the composer. The opera was popular during the 19 th Century but then declined into obscurity in the 20 th Century until 1960 when Maria Callas and Franco Corelli revived interest in the piece in a production at La Scala. The action is set in Armenia in the middle of the 3 rd Century. The country is under Roman occupation and the conquerors have outlawed Christianity and condemned all Christians to death. In the middle of this political cauldron Donizetti inserts a complex love triangle. Paolina is in love with the Roman proconsul, Severo but marries the Armenian nobleman, Poliuto under pressure from her father who tells her that Severo is dead. Poliuto secretly converts to Christianity and Paolina is torn between her loyalty to her husband and her love for Severo, who has recently re-emerged as the conquering hero. When Poliuto’s conversion to Christianity is discovered his fate is sealed. His wife, Paolina spurns Severo’s advances and asks Polituo to baptise her as a Christian before the two go to face death together in the arena. The opera is gloomy and monumental in character and the principal characters go through enormous emotional anguish. Some of the music is of a very high quality – it was better than I was expecting – and it is redolent of middle period Verdi. Director, Mariame Clément, opted for a rather abstract staging rather than a realistic set in order to allow for greater visual fluidity and to make the most of the lighting possibilities. When the opera opens we see grey concrete slabs and characters moving furtively around the stage, anxious as to who might see them. Visual images depicting the siege of Sarajevo by the video artist Anri Sala were projected on to the slabs and at various points the slabs moved around the stage to reveal some hidden scene. The costumes seemed to come from the 1940’s and the army costumes evoked the idea of an undefined oppressive fascist regime. While the striking visual images helped to underscore some of the key themes of the opera around the fear which comes from living under an oppressive regime I was not entirely convinced by this production. The abstract sets suggested an amalgam of ideas which were not defined very clearly and consequently much of the action seemed to take place within a vacuum. The totalitarian regimes of the 1940’s and the siege of Sarajevo are quite different so it was unwise to try to fuse the two things and the attempt to draw parallels between these events and 3 rd Century persecution of Christians did not entirely work for me. Michael Fabiano was on magnificent form and excelled in the principal role of Poliuto. His voice has a rich golden lustre that resounded clearly and powerfully above the orchestra and chorus at various points. His phrasing, tone colour and dynamics were beautifully controlled. He captured splendidly the inner contradictions of the character: during the course of the opera we see him denouncing his wife and thundering against his oppressors while at the end of the piece he achieves a spiritual transcendence, accepting his fate with equanimity. Puerto Rican soprano Ana María Martínez was also superb in the role of Paolina. She gave us exquisitely shaped and shaded lines and handled the demanding vocal gymnastics with ease. The composer doesn’t really explain why Paolina chooses to die with her husband after the initial emotional angst and hand wringing but Martínez’s portrayal of the character was convincing and believable. Igor Golovatenko gave us some very powerful and virile singing in the role Severo. He captured the power and authority of the character to perfection but also the inner turbulence at being forced into a position of having to consign his lover and her husband to death. The rest of the cast were admirable in their roles – there were no weak links. I was particularly impressed with Matthew Rose’s singing and with Gyula Rab from the Glyndebourne Chorus who was making his début in the role of the Christian. The Glyndebourne Chorus were rock solid in the big set piece numbers and they did a great job transforming themselves at various times into professing Christians, army officers and a howling mob at the temple of Jupiter. Enrique Mazzola and the London Philharmonic Orchestra provided a vibrant and flexible accompaniment. Mazzola expertly kept the big set piece numbers on track and the balance of sound was excellent throughout. 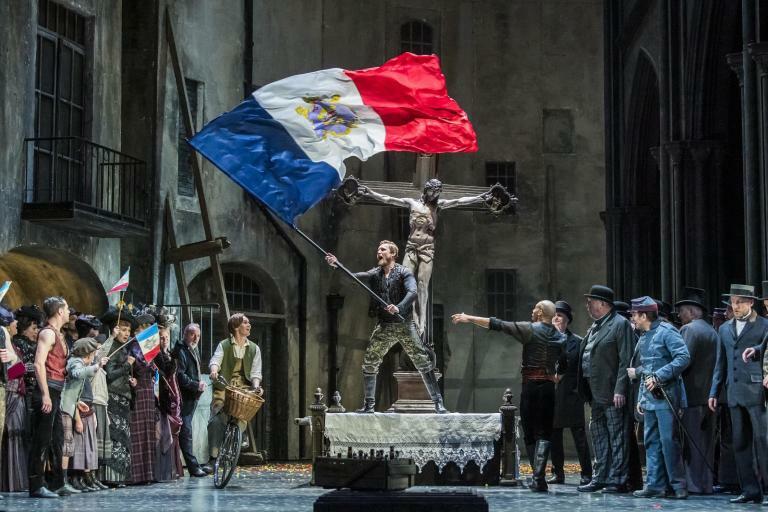 Overall, the cast, chorus and orchestra did an impressive job in introducing this little known opera to the general public – I hope it leads to many more productions and to the opera becoming better known. However, I was less convinced by the abstract staging and sets – a move to a more realistic setting might help to anchor more effectively the dramatic action depicted on stage.